Bikes usually run better when you pull and clean the carb. Makes me wonder if something is going wrong in that. Pushing the enrichener all the way in reduces gas mixture. Just seems to still lean toward the mixture screw or air leak to me. Between sportsterdoc, IXL2Relax and rocketmangb, these guys know just about everything about a CV. As IXL2Relax mentioned, it comes down to a systematic diagnostic approach. I pulled the carb off again. I wanted to clean the enrichener circuit since I didn't do that last time and I also pulled the mixture screw o ring to take a look. 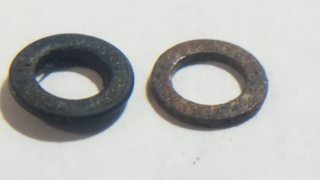 Something kind of weird, the mixture screw washer looks corroded. not sure what would have caused that. I thought it was just dirty when I pulled it earlier. The o ring doesn't look that great either. I'm not sure either one is bad enough to affect anything though. Well done. The description in post 42 seemed to be an overly lean condition. If correct, it is either not getting enough fuel or too much air. Some on this forum will cringe, but will it start with ether applied (one shot into carb throat while cranking)? With float level good, adequate flow through float valve, jets clear, passages clear, then look for extra air as IXL2Relax and HippySmack have already suggested. 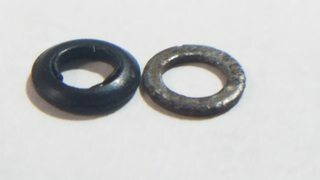 If the carb was inserted dry into the rubber intake, there can easily be a vacuum leak. Best to wet, first. Well done. The description in post 42 seemed to be an overly lean condition. I have been wiping a film of motor oil around the inside of the rubber piece on the intake when pushing the carb on. Hopefully that's good enough. I think it is. The carb made a popping noise like a cork as I pulled it off this afternoon so I think at least that side is a good seal. I'm not sure how to check for intake leaks if I can't keep it running. Ordering new packing tomorrow. I want to be riding this thing, not working on it! Best of my recollection, that's actually suppose to be an O-ring. Yours doesn't look so good to me. Hopefully a new one will get er running. When you install or adjust it, turn it in til it lightly seats without any extra force and stop. An EZjust is nice to work with (I have one also) but your fingers will want to turn it harder than need be to seat. At least I've noticed that with mine.